Magnolias were named after the French botanist, Pierre Magnol. These trees can be evergreen or deciduous and bear beautiful flowers. This genus belongs to the Magnoliaceae family. If you are planning to plant a magnolia tree in your yard, make sure your soil has proper drainage. These plants do not do well with wet feet. Create a watering system to make it easier. 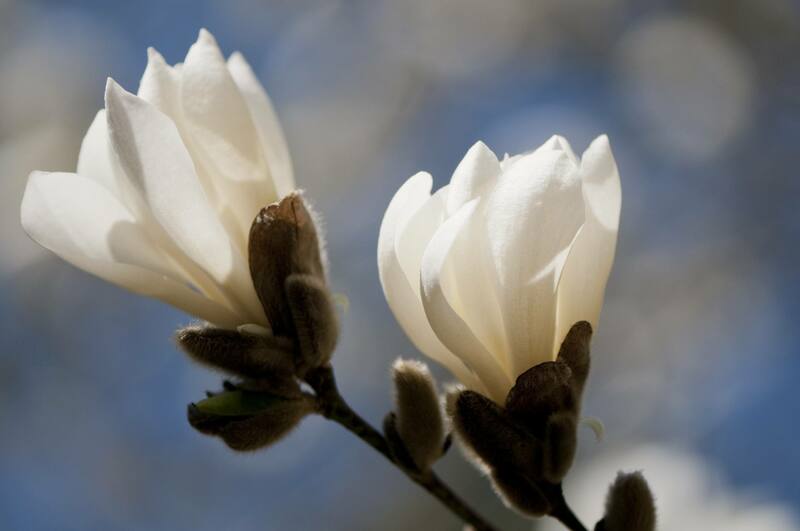 An interesting fact about magnolias is that they are pollinated by beetles. The anise magnolia has leaves that look somewhat like those of a willow tree or shrub. They are wider than willow leaves but not as wide as the usual magnolia leaf. This deciduous tree will produce white flowers with strappy petals before the leaves unfurl. A Japanese native, this magnolia thrives in full sun or partial shade. Ashe's magnolia can be either a large shrub or a small tree. It is sometimes treated as a subspecies of the bigleaf magnolia. Its name was given in honor of William Willard Ashe of the United States Forest Service. This native of North America can grow in full sun or partial shade. Bigleaf magnolia lives up to its name and produces leaves that can be up to 32 inches long. It is one of the magnolias that are usually deciduous, though it can be somewhat evergreen in the warmer zones. The bigleaf magnolia is native to the southeast United States and Mexico. It requires full sun or partial shade for proper growth. Cucumber tree magnolia is so named because the fruits look somewhat like cucumbers. It is also commonly known as the mountain magnolia or the yellow cucumbertree. The flowers are an interesting shade of yellow-green and can be somewhat similar to a tulip. This tree grows best in full sun or partial shade. The lily magnolia is one of the smaller species, forming into a shrub or short tree. It is one of the parents of the saucer magnolia and has reddish-purple or pink flowers that are lightly perfumed. A native of China, it can tolerate some shade but flowers better in full sun. One of the parents of the Loebner magnolia, the Kobus magnolia produces flowers earlier than many other species and tends to form multiple trunks. It is also known by its common name the Northern Japanese magnolia. It grows best in full or partial sun. The Loebner magnolia is a hybrid of Kobus magnolia and star magnolia. It usually has several trunks, but you can create a central leader by pruning. It grows to a modest 30 inches tall. Like most magnolias, it does best in full sun or partial shade. Created by crossing the lily magnolia and the Yulan magnolia, the saucer magnolia can either be a large shrub with more than one trunk or a small tree. While the blossoms are pink on the outside, you will see white if you peek inside. Specific cultivars come in lilac, pink, and white. Its common name is Tulip tree, and it does best in full or partial sun. 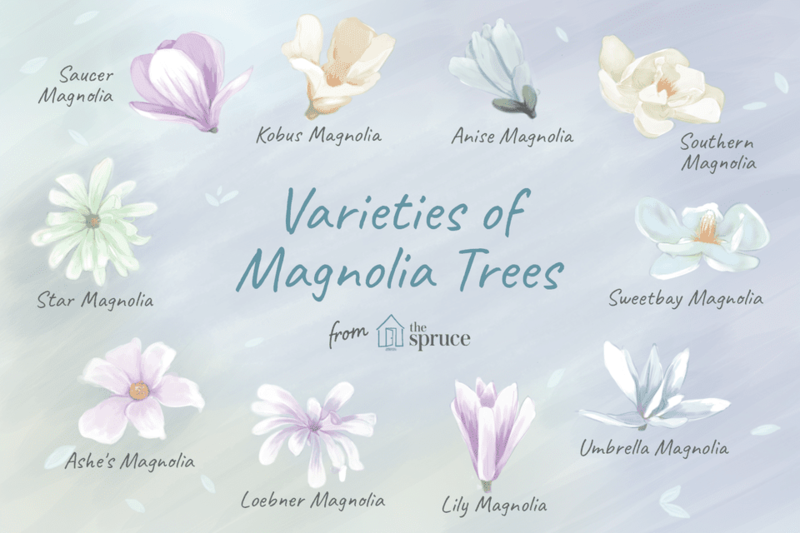 When people mention magnolias, they are likely talking about the Southern magnolia. It is found throughout the southern United States, though it can grow elsewhere. This magnolia's flower is the state flower of Louisiana and Mississippi. The tree is drought-tolerant and grows the best in full sun or partial shade. Star magnolia is deciduous and can be a small tree or a large shrub. It features lovely white blossoms. When possible, plant it in a sheltered location to help it flower in the spring, as the buds are often damaged by frost. This magnolia requires full sun or partial shade. In cooler locations, the sweetbay magnolia is deciduous. It is a native of the eastern United States and is sometimes referred to as a beaver tree. Other common names include swamp magnolia and Laurel magnolia. It will grow in locations with wet soils and full or partial sun. The name umbrella magnolia refers to the appearance of the leaves, which hang down around the ends of their branches. This is a deciduous tree that is hardier than many other magnolias. While it grows best in full sun to part shade, it can survive in full shade.